Most of Ethiopia’s coffee is grown in Oromia, home to the Oromo speaking peoples, the most numerous of the country’s linguistic groups, and the largest of the country’s 9 regional states. Almost all of the rest is grown in the neighbouring Southern Nations, Nationalities and Peoples’ Region. 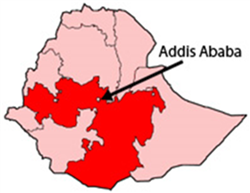 Oromia’s coffee growing areas have the ideal conditions for arabica, characterised by high altitude (above 1,500m. ), rich, well-drained (and mainly volcanic) soils and a highland tropical climate with 1500 – 2500mm rainfall over a nine month period and optimum temperatures between 15 and 240C. Some coffee is grown at greater altitudes but produces lower yields. Within Oromia there are several distinctive regional coffee types, the result of different climatic and soil conditions. Sidamo and Yirgacheffe come from the south; Limu and Nekemte from the west, and Harrar from the east. Most are washed coffees, meaning that the beans are first separated from the fleshy part of the cherry with a lot of water in a mill, and then dried in the sun. The rest are completely sun-dried, meaning that the whole cherries are dried in the sun, until the flesh becomes brittle enough to be removed in a hullery. Another outcome of our visits is that we have learned a great deal about coffee, coffee farming and the world coffee trade. We have also learned about the hardships coffee farmers face from global economic forces over which they have absolutely no control and of which they have very little understanding. In their case these forces are the result, amongst other things, of highly speculative trading on the futures market of the New York Board of Trade (NYBOT) Coffee Exchange. (This is where the global price of arabica – their type of coffee – is set.) And we are now learning more about how the natural variability of their weather patterns is being exacerbated by climate change. Choche’s coffee farmers’ lives are tough. None of them makes a fortune from coffee, but in good years most make enough to get by. However, since 2004, when their cooperative was Fairtrade certified, significant improvements have come to the community. And since 2010 Rotary has played an important part in enhancing the benefits of Fairtrade. According to legend, western Oromia is where coffee was first discovered, over 1000 years ago, in the old kingdom of Kaffa. The story goes that a young goat-herd named Kaldi, noticed his animals getting very frisky after eating the red cherries from a wild bush in the forest. This event is said to have happened in Choche, the community with which our campaign has a friendship link, making Choche the ‘birthplace’ of coffee, though other communities claim this accolade too! Kaffa » caffe » café » coffee. coffee is central to Oromo culture and they consume as much as they sell. One of the most enjoyable aspects of spending time with an Oromo family – or, for that matter, any Ethiopian family – is taking part in the social ritual of ‘the coffee ceremony’. This can happen several times a day, and is not now confined to Oromo culture. First the green beans are washed. Then they are roasted in a shallow skillet over a blazing charcoal brazier, around which are spread flowers. The beans are then ground with a pestle and mortar. The grounds are poured into a long necked coffee pot, called a jabanaa, and boiled for ten minutes, before serving very hot in little cups, laced with sugar. It takes a long time, but it is always worth waiting for! Since 2006 our campaign has had a friendship link with Choche Coffee Farmers’ Multipurpose Cooperative.